I love the way bibliobloggers have utilized the web to promote the biblioblog session. The texts of papers are not only available on the various presenters' weblogs, but now, thanks to Chris, it is also possible to hear audio (podcasts) of the actual presentations. This is great! 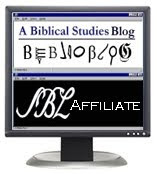 Perhaps this will signal a new era for the SBL. Up until now, scholars have been forced to miss out on interesting papers because so many are presented during the same time slot. However, maybe in the future that will no longer be a problem. Papers / podcasts can be posted on-line after the fact, making them available to everyone! Here's to hoping!